This is the 28th geocache from Team Family Affair. 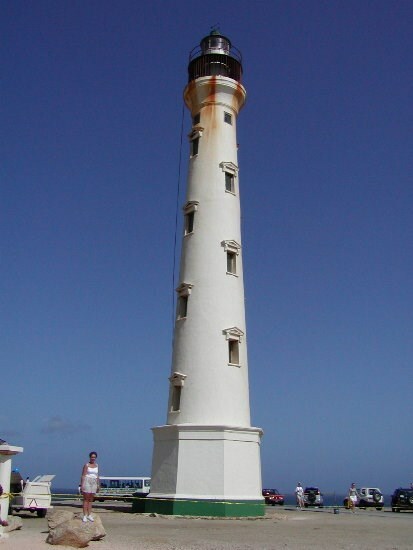 The lighthouse at this site was built in 1914-1916 and is located on the northernmost point of the island of Aruba. 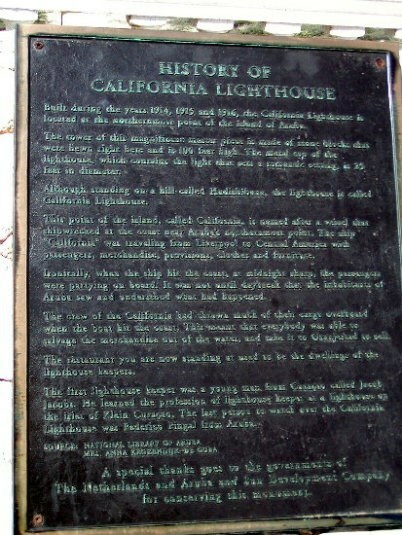 Although standing on a hill called Hudishibana, the light house is called the California Lighthouse. It is named after the ship that wrecked on the coast near this point. The ship named the Californian was traveling from Liverpool to Central America with passengers, merchandise, provisions, clothes and furniture all of which were thrown overboard when the boat hit the coast. This delighted the local people who were able to recover both the passengers and the items washing up on their coast. The Californian's other claim to fame is that it was the ship that failed to respond to the Titanic's distress call on that fateful night in 1912. The lighthouse was built several years later after the shipwreck to avoid further maritime accidents in the dark of the night. Check out the nearby restaurant and gift shop, which was until just a few years ago the home of the lighthouse keepers. Find the location and take a selfie picture of yourself and your team including the lighthouse in the background. Then upload and post it to your “found log” on this geocache page. We hope you enjoy this cache as much as we did creating it!